Primarily as an exercise in space creation using alignments of constructed and carved volumes, this project was designed as a professor's lake house, complete with a lecture space, and outdoor private space. The site, once covered in 8' tall hedge, was to be populated with three planes of limited size within a punctured cube, additional bathroom and kitchen volumes, and a square, gravel, parking area. My design solution focuses on a few specific paths of circulation to guide visitors into either through professor's cube to the lake or to the smaller lecture space, as well as differentiate a lakeside private space for the professor. Photograph views of my 1/8" = 1' wood model, made entirely by hand in the woodshop. A sectional perspective view towards the lake and depicting the play of light within the cube. Hand drawn using graphite. A hand drafted sectional axon, focused on the transverse circulation path, private for the professor. An elevational and sectional view of the project, both hand drafted and focusing on the transition from street to lake. A hand rendered and drafted site plan done in graphite. 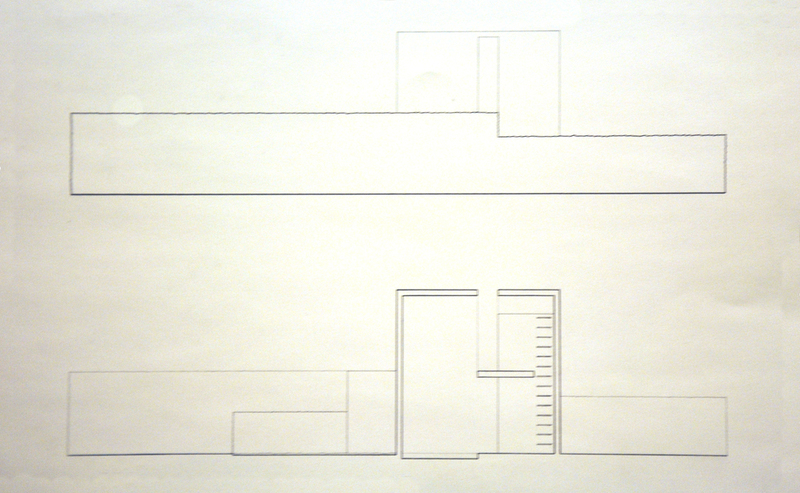 Figure ground and alignment diagrams respectively, both hand drafted and digitally rendered. A diagram of the unfolded cube explaining its openings, hand drafted and computer rendered. Hand drafted and computer rendered axonometric diagrams, the first examining circulation paths and the second examining public vs. private space.